There are many ways to use chia seeds in your day-to-day life. These tiny, tasteless seeds boast big health benefits like increased energy and better digestion. Chia seeds are also a great source of nutrition. Since they boast high amounts of Omega-3s, calcium, and antioxidants, it’s a good idea to have several go-to chia recipes in your diet. Below, discover the best ways to use chia seeds in your daily life and why chia is so healthy for you. You need to start consuming these super seeds right now! Chia seeds have been a part of my life for at least a decade. I was first introduced to these little gems by my mother-in-law before they became popular. She added them to virtually every recipe in her arsenal, and was even known to top her fast food with them. She would rave about how healthy they are, the massive amounts of Omega-3, calcium, and antioxidants. These little seeds look like mini dinosaur eggs close-up and are various shades of black, white, and gray. All have the same nutritious benefits. I mean, how gorgeous are they?? Nowadays, chia seeds are mega popular and can be found everywhere. Even mainstream cereals and granola bars are boasting the addition of chia on their labels. So what’s all the hype about? Here are just a few awesome chia benefits worth raving about. So much power in such a teeny tiny seed! One of the best chia benefits is the large amount of fiber they contain. 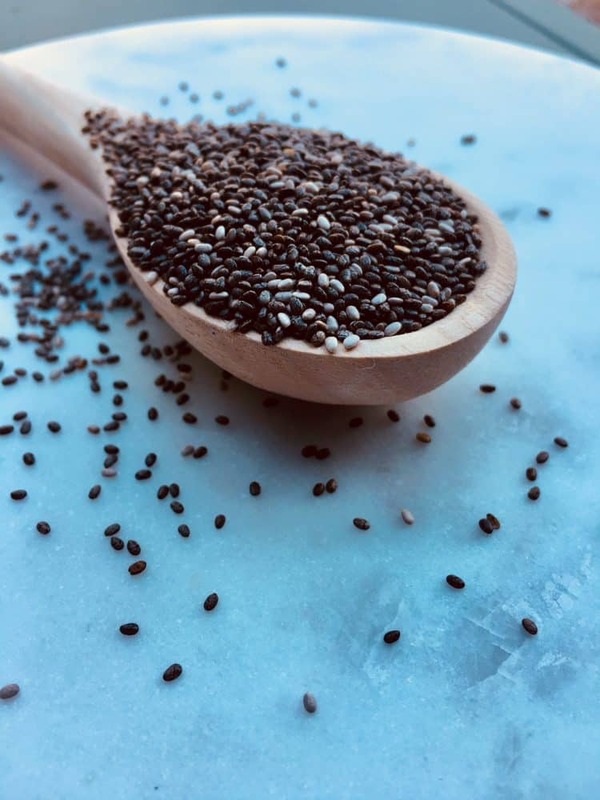 Chia seeds are an easy way to up your fiber content and improve digestion. Sometimes it can be difficult to consume enough fiber via raw fruits, veggies, and whole grains. If you have slowed digestion, try adding chia seeds to your diet – but start with small amounts if you aren’t used to eating them, or you might get stomach cramps. Note: Make sure to drink PLENTY of water when you consume large amounts of chia. Since they absorb vast amounts of liquid (called mucilaginous), you need plenty of fluid so as not to get dehydrated. The only caveat to this is if you have soaked them overnight. Soaking is also a great way to unlock even more nutrients from chia seeds and eliminate any small amounts of phytates (anti nutrients) present. 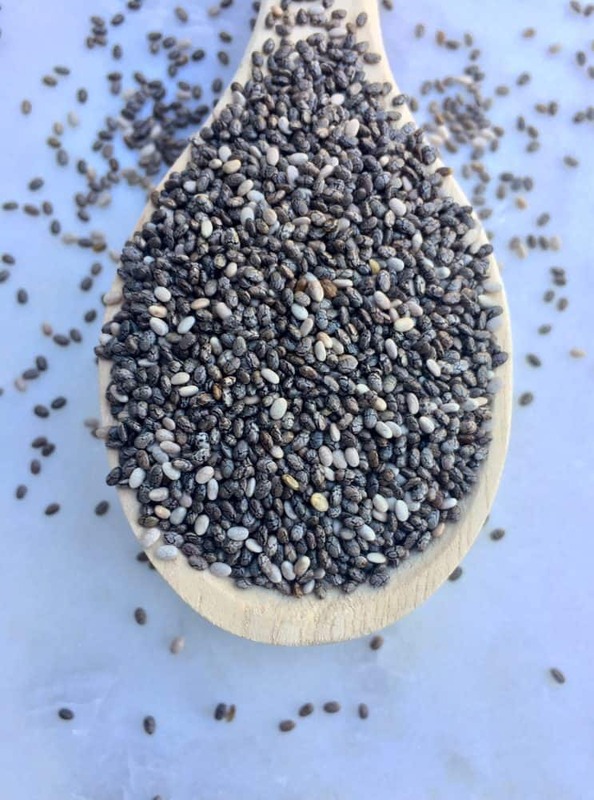 Chia seeds are gluten and grain free, so they are a perfect fit for any diet – vegan, paleo, gluten-free, GAPS, keto, and more. They add a hefty amount of nutrients in a small package. One serving is reported to have as much calcium as a glass of milk, more Omega-3s than a serving of walnuts, and as many antioxidants as blueberries (source)! They’re also a great source of plant based iron and magnesium. So, if you want a crazy EASY way to improve the nutrient content of your diet, it doesn’t get much better than chia seeds. For plant-based protein, chia seeds are top notch. Of course, you still want to get plenty of protein via animal sources as well. But these are a great way to add protein to starchy foods and baked goods. The ancient civilizations believed that the chia seed provided supernatural powers. In Mayan, “chia” means “strength.” This probably has to do with the large amounts of energy provided by chia seeds. Ancient warriors attributed their stamina to this tiny seed. This still holds true for certain groups of people today. The Mexican Tarahumara tribe is famous for their runners. These runners drink a mixture of chia seeds, lemon, and water called Iskiate. After drinking this, they are said to be able to run hundreds of miles. Something with that kind of track record deserves our attention. Pretty cool, right?! If you want to go more in-depth about chia benefits, this article is a great resource. I recommend using ground chia seeds in most chia recipes, unless otherwise indicated. Doing so will ensure your body gets the most chia nutrition possible. It also allows for a nicer consistency in recipes. It is better to grind them yourself rather than use pre-ground for freshness and potency. We like to use a small coffee grinder to grind our chia seeds as we need them. It is so easy and only takes a second. Since chia seeds are so popular, you can now find them in any health food store and even some supermarkets. Another great idea is buying chia in bulk online. 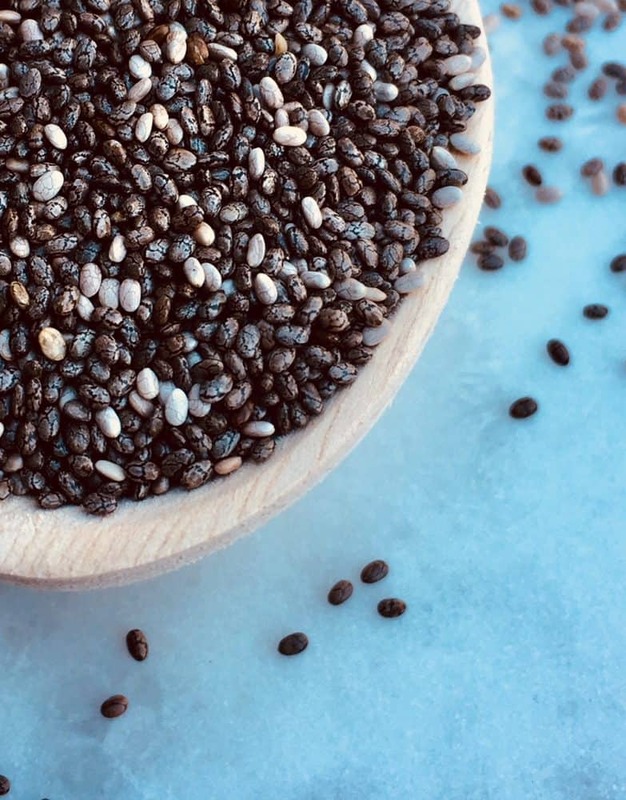 Now that we know all the amazing chia benefits for the body, let’s discover the best ways to incorporate them into your daily life with simple chia recipes! It’s really easy to do, since chia seeds have virtually no taste and will not affect the flavor of any of your foods. Soak chia seeds in water for several minutes or longer to create a gel, which is the perfect egg substitute. To make, add 1 tablespoon chia seeds (preferably ground) and 3 tablespoons water to a small dish and stir. Soak for at least five minutes. It will turn into the perfect gel to substitute one egg in any baking recipe. You can keep this mixture in the fridge for several days as well, if you want to make a bigger batch of the gel and add it to your recipes. I have used this hack on more than one occasion when I was in the middle of making homemade cornbread and realized I had run out of eggs. Not to worry! Chia gel to the rescue. I also read that you can use chia gel as a substitute for butter, although I have not personally tried this. Instead of using corn starch or flour to thicken your soups and gravies, try chia seeds instead! This is particularly useful if you are on a special diet, such as gluten free (no flour) or paleo (no corn/grains). Chia is compliant with pretty much every diet on the planet. You can add ground chia seeds to any liquid mixture to thicken it up. Or, try adding some of the chia gel mentioned above. Here’s a quick recipe that is great for breakfast or a healthy snack. Add 1/4 cup chia seeds (this time you want to use the whole seeds, not ground), 3/4 cup full fat coconut milk (we like this kind), 1/2 cup juice or water of your choice, a splash of vanilla extract (optional), and a pinch of himalayan salt. Stir well and allow to chill in the fridge for several hours or overnight. I used this recipe from The Healthy Foodie for inspiration. Sweeten to taste with your favorite sweetener like honey or pure maple syrup. Easy and nutritious! Note: If you’re not used to the seedy texture, try adding a seeded fruit or jam like raspberries or blackberries to complement the texture. This is my husband’s favorite way to eat this – it’s similar to rice pudding. Remember how ancient warriors used chia to “power up” before a competition? You can use them the same way any time you need an extra boost. Try adding a teaspoon of chia and a squeeze of lemon to a glass of water for a natural source of energy as an alternative to caffeine, without the crash. One of our family’s favorite ways to use chia seeds is adding them into smoothies. We have a nutritious smoothie nearly every morning for breakfast which includes frozen fruit, coconut oil, greek yogurt, and chia seeds. Our high powered blender (like this) does all the grinding work, so I can add in whole chia seeds and skip the DIY grinding step. The other item we eat for breakfast 9 times out of 10 is nutritious oatmeal. We like adding peanut butter and maple syrup to ours. Oatmeal (or any kind of cereal) is another great place to get your daily dose of chia. It mixes in perfectly and ups the nutrient value of your breakfast. Chia seeds can be added to virtually any baked item seamlessly. They will not alter the flavor of your cakes, muffins, or breads. You can even use ground chia seeds in lieu of flour/breadcrumbs in my favorite homemade meatballs. 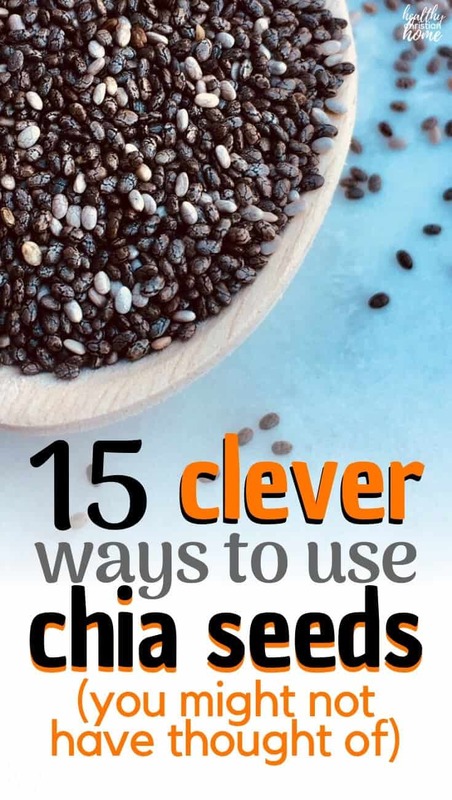 This is one of the easiest ways to use chia seeds, but very effective. Every time my husband starts to feel sick, he mixes up an orange juice elixir to help combat illness. The combination is rich in Vitamin C and antioxidants to fight a cold or flu, as mentioned in this post “20+ Natural Remedies for Cold and Flu Season“. 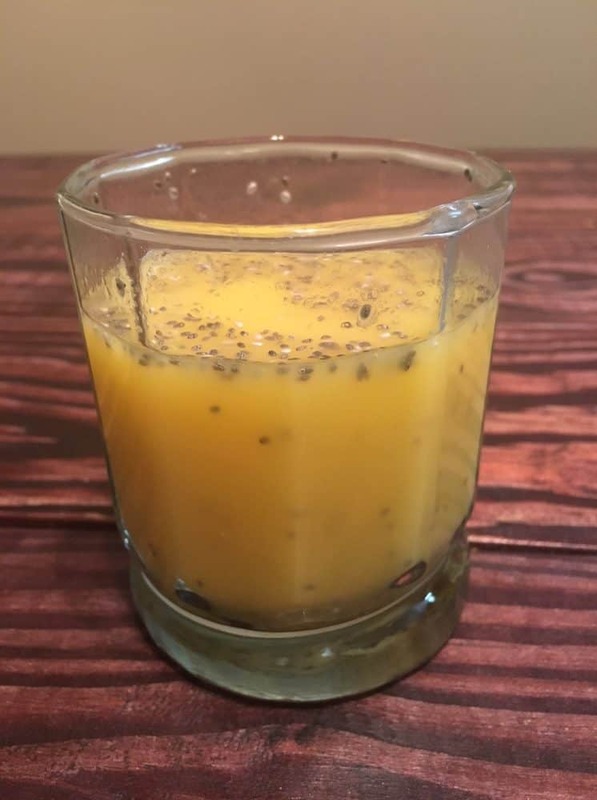 Add 1 tablespoon chia to 8-12 ounces orange juice, stir well, allow to sit for approximately 30 minutes, and drink. 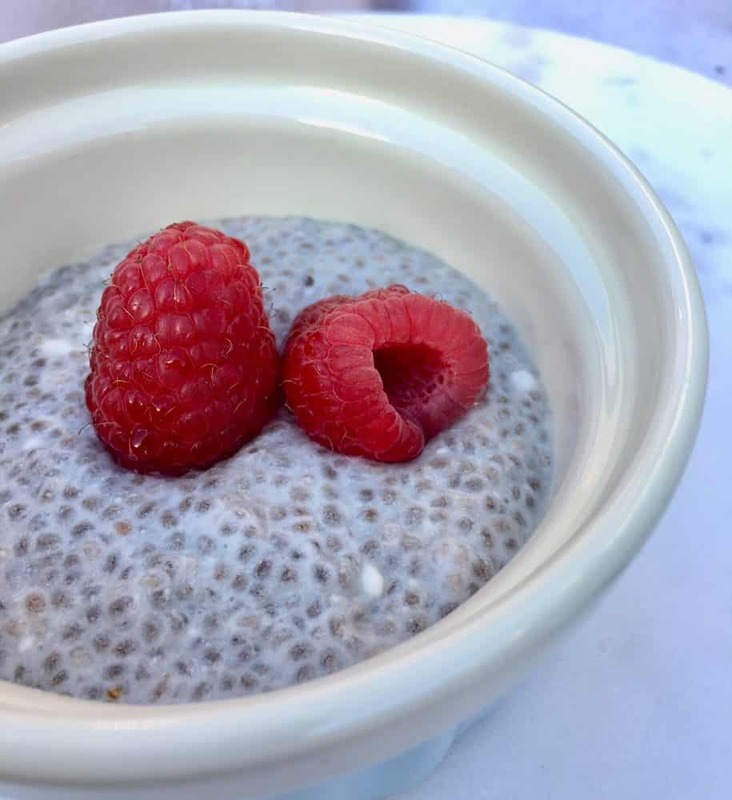 This healthy dessert is DIVINE, and its one of the easiest chia recipes. It’s similar to the chia pudding, but is blended smooth with the addition of chocolate and avocado. It’s a great substitute for chocolate ice cream or regular chocolate pudding in a healthy diet. My husband and kids love this and ask for it often! Check out the recipe here. This is another of my mother-in-law’s chia creations, and it’s a brilliant idea. Because of chia’s thickening properties, it’s a perfect addition to homemade jam. You can hop over to The Kitchn for an amazing tutorial on how to make homemade chia jam from any kind of fruit. Oh, wouldn’t this be just heavenly on my favorite perfect buttermilk biscuits? Another one of the ways to use chia seeds is homemade energy bars. Energy bars feel like such a decadence to me. I love having them around (hello, LARABAR) as an easy snack with zero effort, but they’re EXPENSIVE. Instead, you can make your own with chia seeds. They are an excellent base for this easy homemade energy bar recipe from Wellness Mama. Another great idea is prepping some no-bake snack balls featuring chia seeds for a quick pick-me-up. There are tons of recipes on Pinterest, but these Healthy Lemon Coconut Energy Balls look especially yummy. Using chia seeds as “healthy sprinkles” is definitely one of my favorite ways to incorporate them regularly. As my mother-in-law says, “they make anything a virtual health food!” She keeps a salt shaker filled with ground up chia and tops everything with it, from salad to donuts. She even carries them in her purse. My husband used this hack while counseling at a youth summer camp. He said it saved his stomach from all the junk food! Chia seeds are also amazing sprinkled in a salad – even better than sunflower seeds. Truthfully, my first introduction to chia was “chia pets” from the 90s! Does anyone else remember this? You can make your own chia pet by planting the seeds yourself – they sprout quickly. Sprouting them actually increases the nutrient content. And consuming the sprouts in salads is one of the most excellent ways to use chia seeds. One quick way to sprout them is to spread a wet paper towel in a container, sprinkle a thin layer of chia seeds on top, then cover with another wet paper towel. Place in a dark cupboard for several days, and you’ll have your own chia sprouts. If you’d rather have a large chia plant in your garden, here’s an article from Den Garden on how to grow a backyard chia plant. I hope you’ve learned a little about chia benefits and the best ways to use chia seeds. Try some of these out today! Have you ever used chia seeds? What are your favorite ways to use chia seeds? Oh my god I LOVE chia seeds! We use them everyday- so full of nutrients! I love chia seeds! I try to sneak them in wherever I can. 🙂 I have yet to make chia jam, though… I really want to try it! They are seriously amazing! My mother in law makes good chia jam. Thank you Megan! 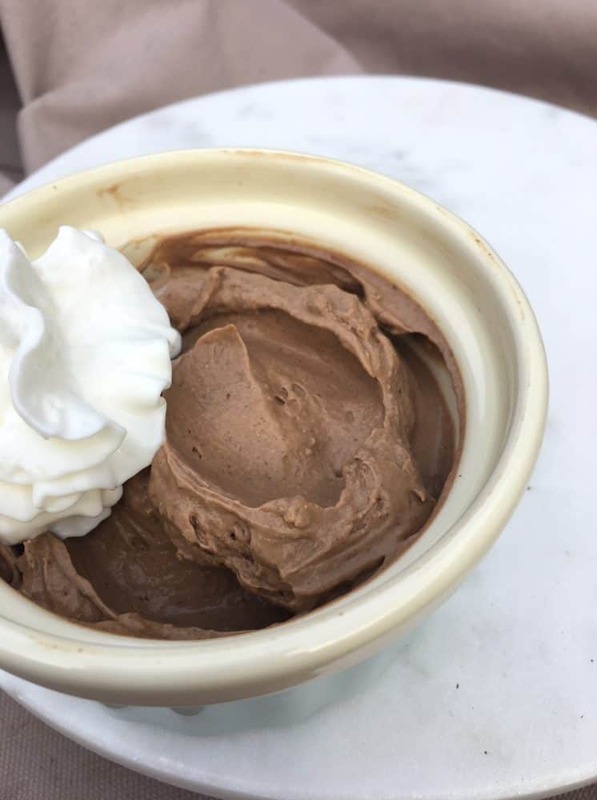 The mousse is definitely one of my favorites. Chia is so versatile! I never knew you could use them to thicken gravies and sauces! I learned something new today! Thank you! You’re welcome Lindsey! Thanks for reading! I love to sprinkle it on everything whole.